Buckland Hall in the Brecon Beacons was the familiar setting when we returned to Wales for The Retreat on June 2 and 3. More than 50 people joined us for a weekend of workshops, singing, and fun and games in a picturesque setting blessed by glorious weather. Rhythm was the order of the day when Music and the Muse led workshops where members could try their hand at different styles of drumming, including Brazilian Samba and Japanese Teiko drumming. Meanwhile, for Retreaters who preferred a change of tempo, there was a Yoga class and the chance to have a hand massage. Inbetween the workshops, there was a chance to walk the grounds of Buckland Hall or to simply sit, chat and share experiences of encephalitis with other members. This year’s Retreat was another wonderful weekend which had so many memorable moments. Whether it was everyone singing ‘Hey Jude’ when we were taking the group photo, the charades and singalong at the campfire on Saturday night or the spontaneous public speaking and raffle at our meal times, there was always something fun happening around the corner. I would just like to say thank you to Buckland Hall, our volunteer Andrea Ainley and Joan and Eddie Owen for organizing the raffle. Leigh Day solicitors provided us with some valuable legal information, Music and the Muse entertained everyone with their workshops, as did Hazel the masseuse, while the Retreat itself was captured on film by Tim from We are Lumiere. 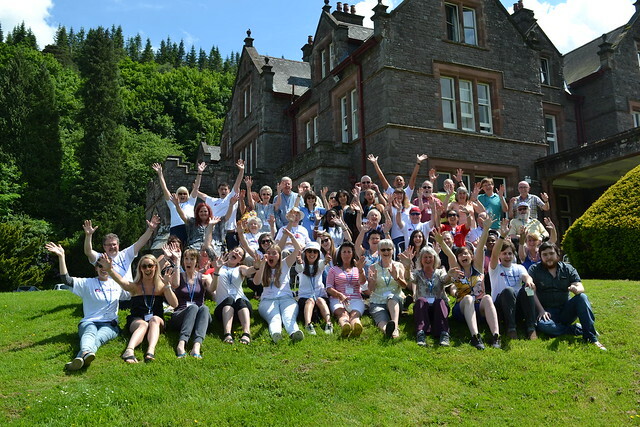 And – finally – a big thank you to everyone who attended the Retreat and made it such a wonderful weekend!